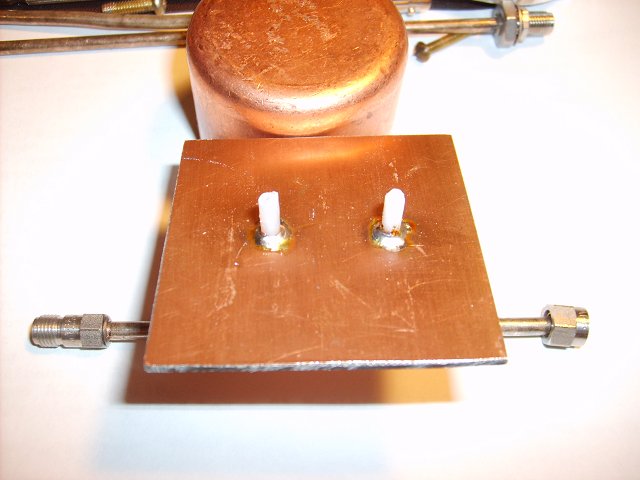 An inexpensive narrow band filter design for the microwave frequencies is the pipe cap filter. This page describes a filter I built for 2.263 GHz to receive the Japanese Lunar Orbiter SELENE (Ref 1). It will become part of my receiver (Ref 2). The filter is built with a 1 5/8" inside diameter pipe cap. It is actually called a 1 1/2" pipe cap because it matches a pipe with a nominal 1 1/2" inside diameter. I have also built a couple of filters for 10.368 using 1/2" pipe caps. I have checked the resonance of various size caps to help select the right pipe cap for the particular frequency you are interested in (Ref 4). These pictures show the 2.263 GHz filter during assembly. 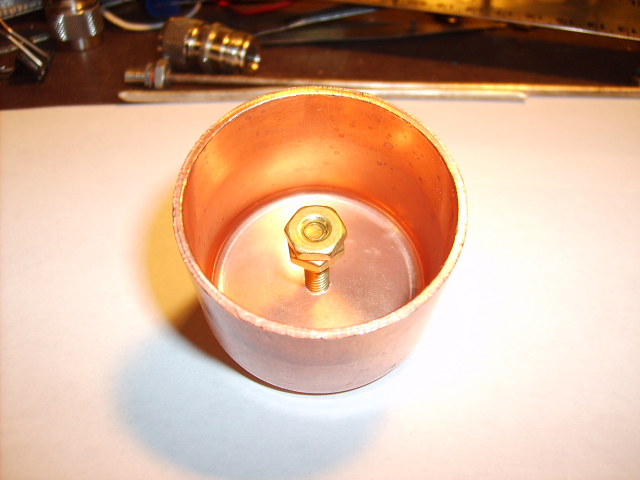 The base of the filter is made of double sided copper clad. The material used is not too critical, but since it will get hot during soldering, so I recommend using a good grade of material. FR4 is fine. The length of exposed conductor of the probes is the only critical dimension. Their location or spacing is not very critical. The longer the probes, the lower the insertion loss but also the wider the bandwidth. You need to leave the insulation on the exposed part of the probe. I am not sure why, but that's what everybody recommends. I used 0.141" semi-rigid cable, which is soldered on both sides to the double-sided FR4 PWB material used for the base. 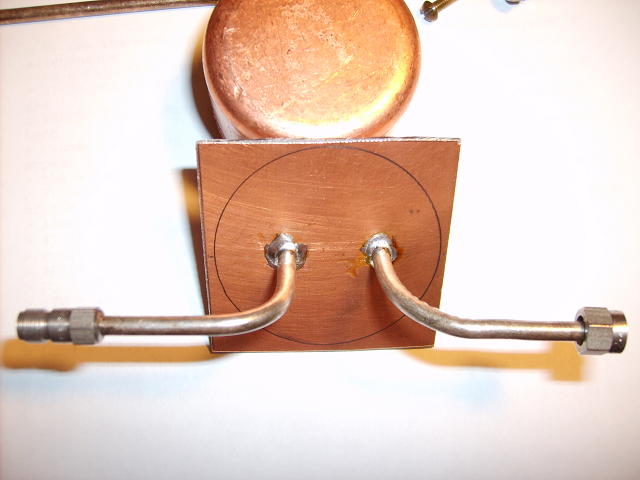 Try to keep the length of outer conductor inside the filter as short as practical. I had about 1mm, which is sufficient for a nice solder filet. The dimensions shown in the picture below were used to build the filter which provided the response shown later in this page. These dimensions are probably optimum for this application. The filter is sharp with less than 3dB of insertion loss (the calibration of the power meter, which is about 1dB off) is not taken into account in the plot). 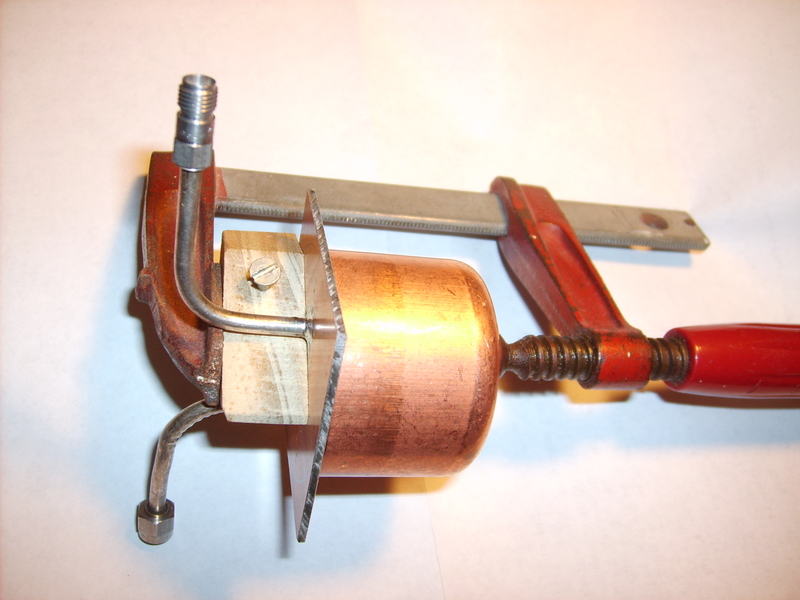 In that picture, the filter is not soldered yet, it is assembled with a C clamp to allow tuning of the probes. This is the configuration I used to plot the response below. The following screen shot shows the response of the filter. When I made this plot, the filter had a tuning screw inside to bring the resonance down to around 2.265 GHz. These plots were made under GPIB control, using an HP 8673M synthesizer and an HP 436 power meter with HP 8481A power head. The filter was modified, the probes were reduced from 7mm to 6mm and the response plotted again. The overall response or insertion loss at the center frequency did not change, but the skirts are a little bit sharper. The attenuation at ~30 MHz is marginally better. The small bumps in the response are due to the signal generator not liking the reactance of the filter very much. I had a 2dB attenuator between the generator and the filter for that plot, and I know that another 3-5 dB would get rid of the bumps, but it would also reduce the dynamic range of the measurement, so I left it with 2 dB. I plotted the response after soldering the cap to the PWB and it was virtually identical. So, if soldering has so little effect, I believe that silver plating is not necessary or even useful either. Knowing that anything inside a cavity will lower its Q, I wanted to find a pipe cap as close to 2.2 GHz as possible to minimize the amount of screw intrusion needed to bring it down. On the other hand, if the cavity is too big, I won't be able to (easily) bring its resonance up. So I made a new PWB filter base and checked the pipe caps I had for resonance without any screw. The critical dimension is the inside diameter of the pipe cap, which is not the same as the standard pipe cap size. The standard pipe cap size (the one you see listed at the hardware store) is the inside dimension of the copper pipe that matches the pipe cap, so the pipe cap inside dimension is equal to the outside dimension of the copper tube plus a small gap for the solder to flow. The first dimension is the standard dimension, the second dimension is the actual inside diameter. I did not check the 1/2" cap because my probes were too far apart. I did not check the 2" cap that was at the hardware store because they wanted $7.50 for one, compared to $2.50 for the 1 1/2" cap. Interestingly, it looks like the 3/4" cap is almost good for 10.368. I will try to file it and see if I can bring it up some. It would probably work better (higher Q) than the 1/2" at 10.368. The probe size was the same for all the tests (0.25") and spacing (almost 3/4") which made it hard for the 3/4" cap. So I did not try to measure Q or insertion loss. In any case, since the pipe caps were held with a C clamp, the Q was probably not very good anyhow.